Vettel had arrived back in the paddock having completed his Top Gear run in the Reasonably Priced Car, and this was the moment he’d come back in to the paddock and saw Nick Heidfeld and was just talking to him about his laps and about how crap the car was! He was explaining that it was really bad oversteer and really bad understeer, but he was pretty pleased. I think he just enjoyed the whole experience and warmed to the crowd. It was good to see him laughing, he had arrived reasonably early and it is very rare to see a driver just stood around talking and when those sort of things do happen you’ve got to pounce on it. This picture is on the Thursday, but we did have a massive downpour after the race too, which the teams weren’t too happy about as they don’t like putting stuff away wet. It was crazy weather on Thursday, it was like being in Malaysia, the weather was just building and building. We were in the Eifel Mountains which can be nice but can be really bad. The rain seems to be following us for some reason! You can see that people are still working under umbrellas, because they had to get their tyres. 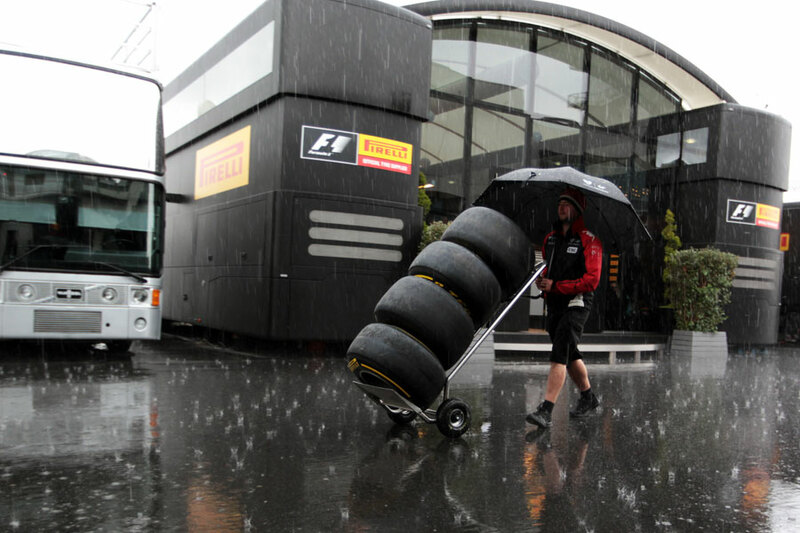 But the funny thing about this one is that the Virgin mechanic has got a load of slicks! It looked odd, but obviously they knew the weather would change. It still made for some funny pictures though, luckily I was hiding under the Red Bull trucks to keep dry but still shoot. This was down in to the first corner, and was typical of all of the drivers over the weekend. It’s hard on the brakes because it’s downhill, so you’re braking on that camber – it’s like driving a car down a mountain; you can smell the brakes on the way down as they are made to work harder. The first corner was a brilliant place to see drivers trying to be precise, here Buemi has locked up, but then you also have the big drop in the middle of the turn too. It was great to watch Kobayashi and Alonso every lap throwing it in and banging it over the kerb, and you can really see the wings flex as they go in. The cars take a real hammering through there as drivers often lock up and then attack the kerb as they try to find time. I think I selected something similar last year, but it’s amazing that Newey is still looking and is still inquisitive about what is on the back of that car; he just seems to be looking at the rear of it. The Red Bull is clearly the best car and I almost don’t see why he needs to look, but this is the only opportunity he gets to look at other cars. What’s quite funny is he still has his notepad under his arm; he still writes everything down and he’s not the kind of guy to use CAD. 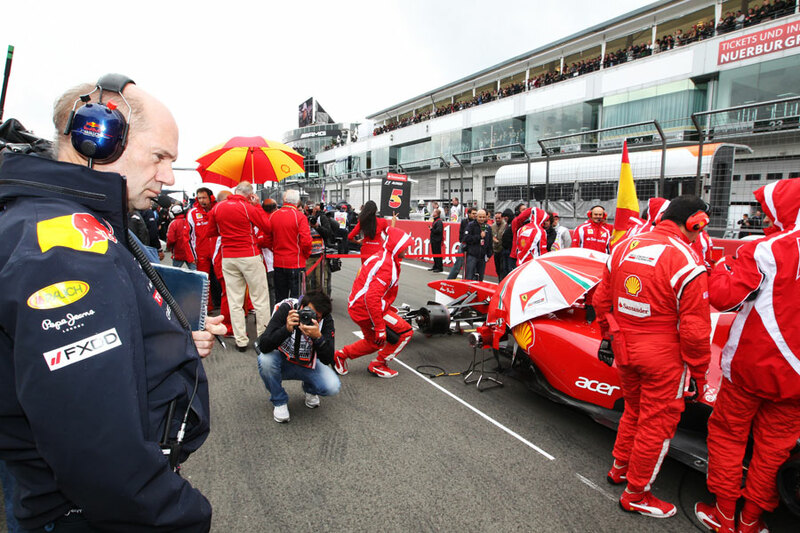 It all seems to go in to his head and then I think he writes things down on the pit wall. As someone who’s at the cutting edge of design and technology it’s surprising that he uses his notepad rather than an iPad, but he’s set in his ways and very, very clever. Here Hamilton has just re-taken Webber and is defending in to turn one, and what’s interesting is that you can see they’ve crossed in to the pit lane exit. I thought they were banned from doing that as it could be quite dangerous and you could in theory have a massive crash. 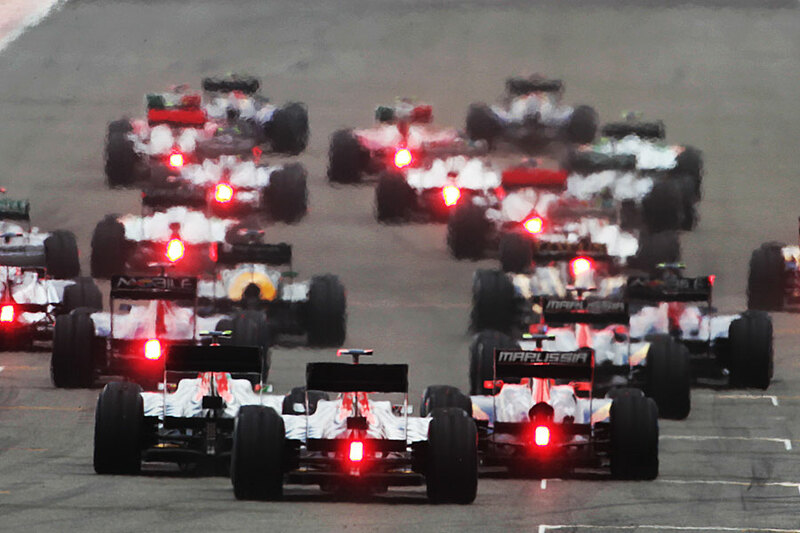 I had positioned myself at the first corner and the amount of overtaking was unbelievable. It’s almost like the DRS zone closed cars up ready for turn one, and the fact that the corner is downhill, fairly wide and almost the perfect corner for overtaking. I wish I’d stayed there thinking about it now as there was a lot of overtaking there that I missed, but as a photographer you want to move around and get some different shots and perspectives on the race, but it’s typical that you’ll miss some things, you can’t be everywhere at once. It’s all about a bit of luck in this business. We’re normally behind the second barrier where the teams are, but when we were let in to parc ferme we were allowed up to the first fence. So we were sort of in front of all the team. Lewis got out of the car, did all of his celebrations and then was looking around for his team. 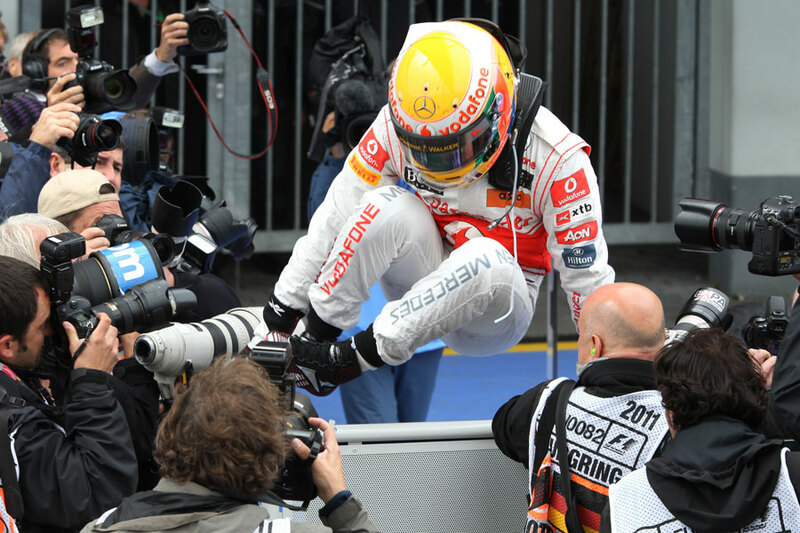 When he saw the team over behind the mass of photographers he decided to bounce off his car, took a couple of steps and then ‘boom’; straight over the barrier. I was perched on the pit wall and I couldn’t see where he went so I just shot him bouncing over the wall. It’s quite funny seeing the reactions of some of the photographers who are totally unprepared for it with the wrong lenses on. Fortunately I had pre-empted it and got him just as he jumped; he looks like a hurdler or someone mounting a horse. That’s the thing with Formula One; sometimes you’re lucky and you’ve got the right lens on and sometimes you don’t know what the hell is going to happen! It’s not the cleanest picture in the world but I think the photographers around him add to the shot. This was a bizarre moment and I must admit I still don’t know what it was all about. It seemed to me like it was all to do with Eddie’s glasses, which are very similar to Bernie’s and very Andy Warhol-esque. Bernie pointed at them and then took them off him and Eddie retaliated by stealing Bernie’s. They had a bit of a pretend scrap before calming down and posing for a photo wearing each other’s eyewear. The two of them obviously have a good rapport going after all their time in F1 together and you can see that in the paddock at most weekends. We knew Prince Harry would come to the circuit on race day and there was actually an open pitch for agencies to be the Royal photographer for the day and get the best access. Rather predictably The Sun got it, but we still put two photographers on him to follow him around and get as many shots as possible. When he arrived there must have been about 40 or 50 photographers waiting for him at the swipe gate and he posed for photos with Jean Todt, Sir Jackie Stewart and Bernie Ecclestone. He then walked the length of the paddock to the Red Bull energy station and went down into the garage where I managed to get some good shots. 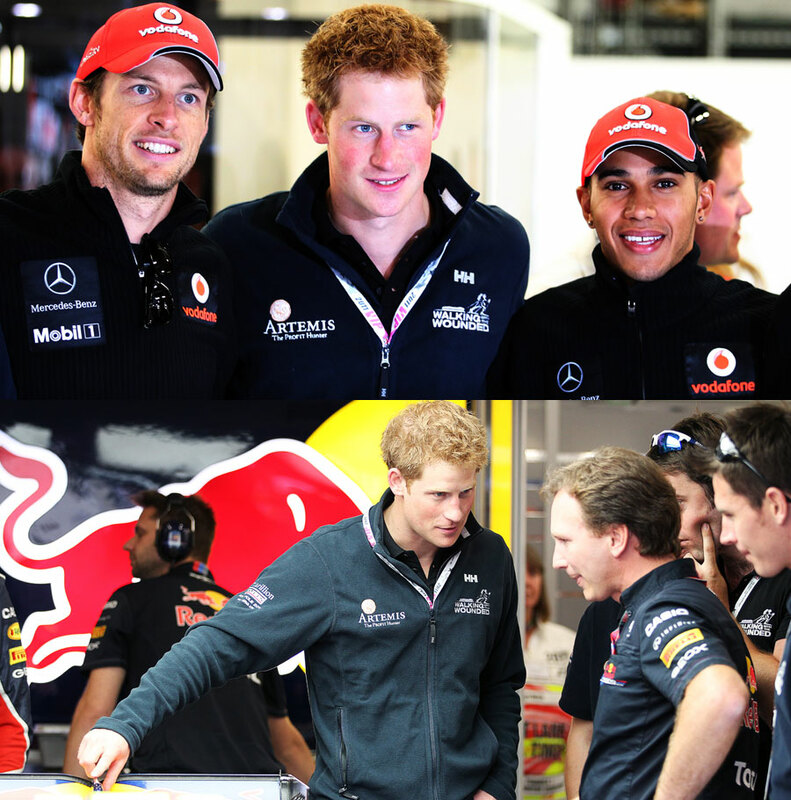 The drivers were on the parade at the time but he was there with Christian Horner and got a close look at the cars. 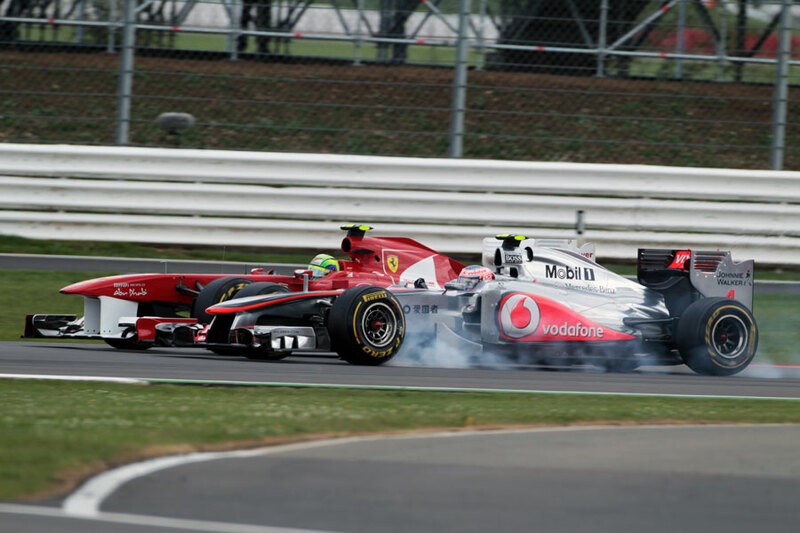 Then he went to McLaren but again there were no drivers. Eventually we managed to get him together with Jenson Button and Lewis Hamilton and I was on pole position to get the shot. The paparazzi were after a shot of Button and Harry together because he’s now going out with Button’s ex-girlfriendFlorence Brudenell-Bruce and that makes a good story for the papers! Ahead of the race I was doing my usual grid walk, taking photos of the plethora of celebrities on the grid. As I walked off the back of the grid I looked back and saw a potential shot of the rear of the cars as they left the grid. There’s quite a lot of heat haze with the all the exhaust, but I think all the rain lights make for a great photo and the focus is sharp on the last car which is Daniel Ricciardo’s Hispania. 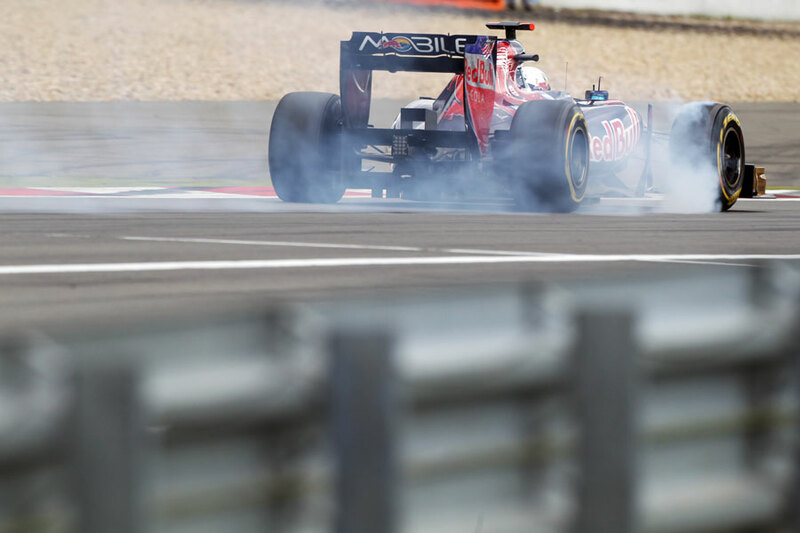 It’s a great shot and it made the Parting Shot in GP Week on Monday. After the start I moved down to Club corner where there is now a great atmosphere during race. There’s a big bank for people to sit on that reminds me of Donington or Brands Hatch, and when the British drivers come past there is a massive cheer from the crowd. It makes you feel really patriotic with a little tingle on the arms and it’s a really special experience. There’s also a big TV screen positioned there and I could see that Jenson Button was hot on the heels of Felipe Massa for quite a few laps before I took this photo. Eventually he got a good enough tow down the Hanger straight and managed to follow him through Stowe and pass into Vale. He made a massive lock-up but still made the move stick and it turned the whole atmosphere up another notch. After the race I was looking for a good spot to get some photos of the podium when I remembered that the circuit had said I could go upstairs on the new Wing where no other photographers were allowed to go. Prince Harry had been up there for the race so security was tight, and as I ran up the stairs carrying all my kit a security guard stopped me and asked where I thought I was going. I explained who I was and he eventually let me past, but was still moaning as I made my way up to the top of the stairs – I ignored him. Once I was up there I made my way to the front of the balcony where Lord March and several members of the BRDC were watching. To be honest I got quite lucky because the drivers came down to the near end of the podium with their champagne, and without that the picture wouldn’t have been the same. 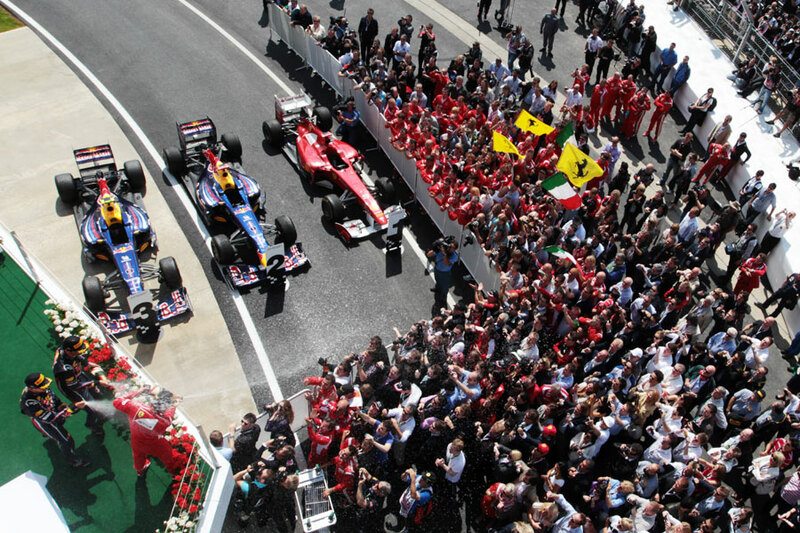 So in the end I had this great wide-angle shot of the celebrations, the cars in parc ferme and the teams celebrating in the pit lane. This was taken at about 5pm because Ferrari always waits until the official classification before it starts having any celebration shots. McLaren and Red Bull go for it straight away when they win, but Ferrari is a little bit more cautious about those kinds of things. 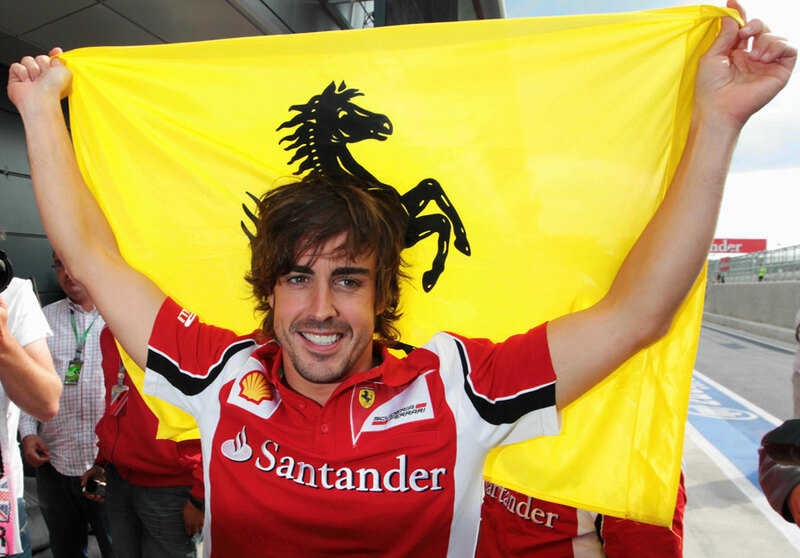 We got some good photos of all the team together and then there were these flags on the floor and Fernando came forward and lifted it behind his back. The Italian photographers swarmed around him and I was just holding my camera in front of them and reeling off the shots. I was actually quite lucky to get this shot because it is lit by someone else’s flash and I had no idea how it would come out when I pressed the shutter release. It was a perfect picture to end the day and it was nice to see a new winner on top of the podium. Obviously Vettel is on six wins and the rest are on three combined so it’s still not looking that competitive, but we might have some more exciting races to come. These were taken on Thursday morning when I arrived at the track quite early. 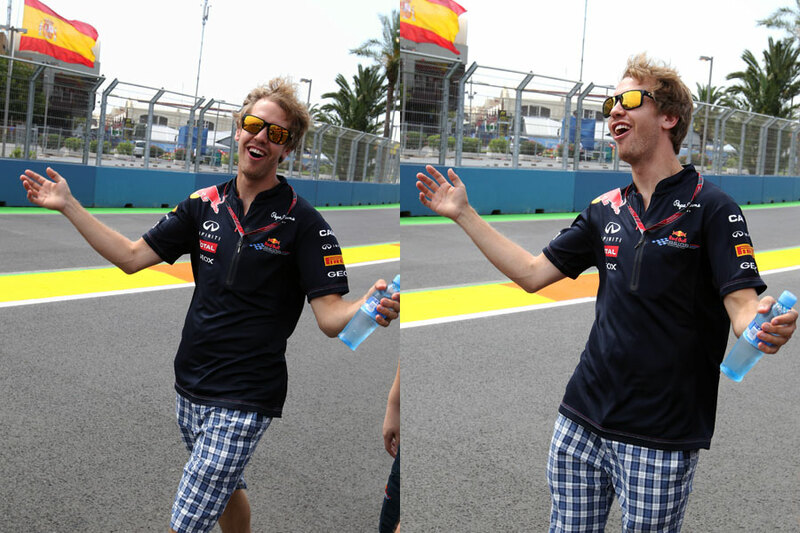 I saw Sebastian Vettel heading out to the track at about 10am and I followed him out. He started pulling these silly faces and doing all these hand actions, I don’t know what the hell he was up to and I wasn’t really listening to his conversation with his engineers, I was more concerned about getting some good shots. He turned around to me and joked: “Why are you always here when I pull funny faces?” I shook his hand and had a quick chat and by the time he got to the second corner I left him to it. I wasn’t sure whether I should put them up on the Sutton website so I just left it to our photo editor to make the decision and he went for it. 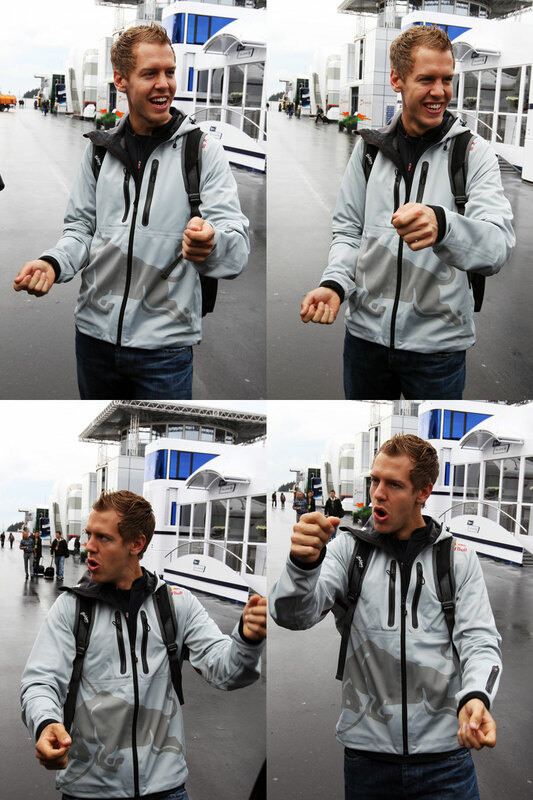 Later in the day I saw Seb’s trainer, who had also been on the track walk, and he asked if I’d put the pictures up. I said yes and he said: “He’ll look forward to seeing them later!” I asked if Seb had a twitter account because I wanted to tweet it to him, but sadly I was told that he doesn’t have an official one. This was my position for most of the race: the outside of turn 12. It was probably a mistake as it took such a long time to get out there from the paddock, but the plus side was that I was the only photographer on that side of the track. I was really hoping something big would happen because it’s one of the DRS overtaking zones. 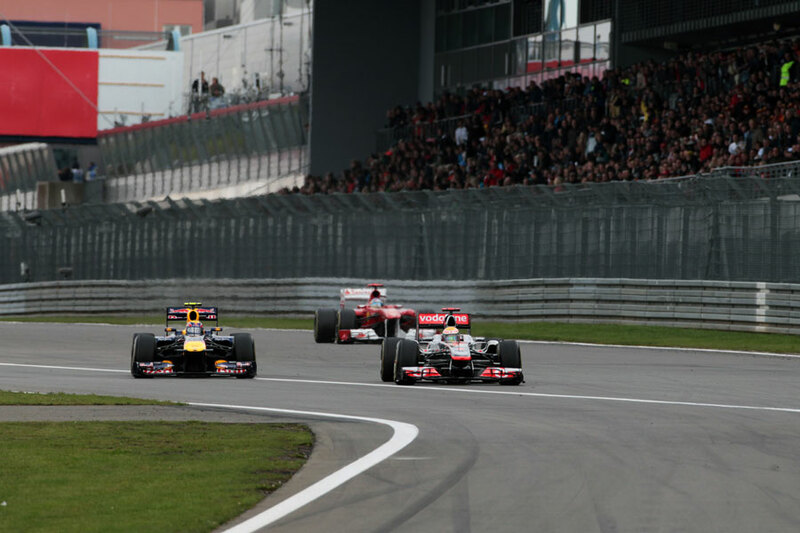 There and turn 17 are action spots during the race and that was the two choice I had. 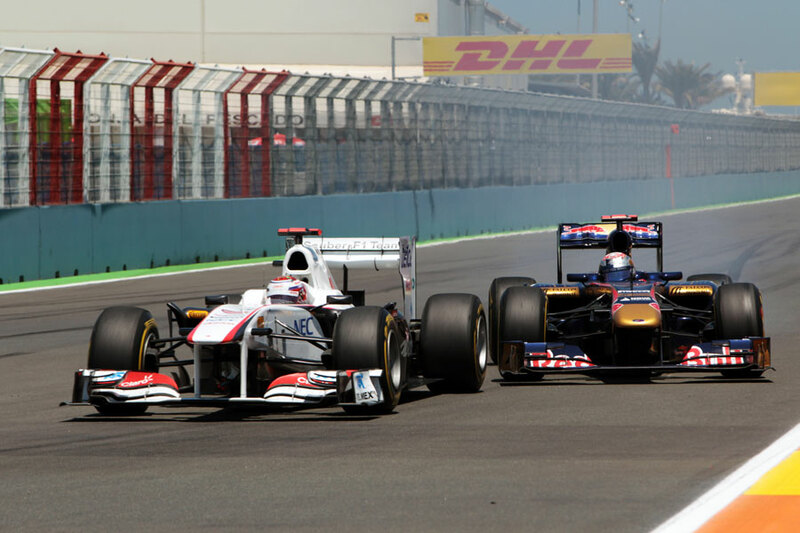 Turn 12 is also where Mark Webber had his huge accident last year, which none of the photographers got. It’s a nice angle because it’s head on and if you were stood in the more popular position on the inside you would only get side-by-side shots. There are about 90 photographers at the grand prix so it was nice to get something exclusive, having said that I probably won’t go back there next year! This is an unusual angle because I was positioned down in parc ferme to get photos of the top three as they got out the car and I thought I’d try my luck and stay there for the podium. At first I couldn’t see what was going on during national anthems and trophy presentation because I was tucked right under the rostrum where. 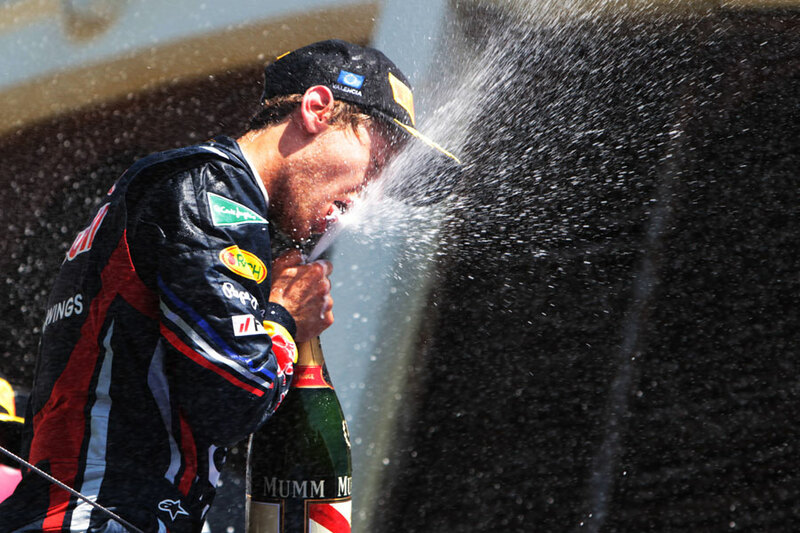 But as the champagne started to flow Sebastian came forward and sprayed it into his mouth right above me. I think it’s one of the best shots of the podium that weekend because I’m right underneath it and it’s not obscured by spray or shadows. It’s a great champagne moment, and you’ve got Valencia on the side of his hat so it’s identifiable as the European Grand Prix. This was quite a funny sequence of pictures. 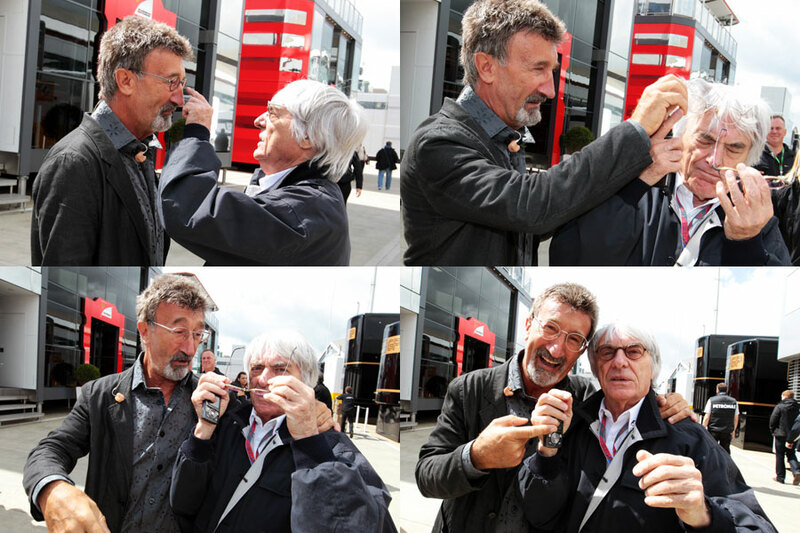 They were taken after the race when Mark came back to the Energy Station in the paddock. I was just hanging around outside to pre-empt the usual celebration pictures and I saw him come back quite early. He went in, high-fived people and seemed happy – he said after the race that he was pleased with his performance even though he finished third rather than second. He then sat down and started talking to Christian Horner and I just popped my lens over one of the open windows and shot into the Energy Station. 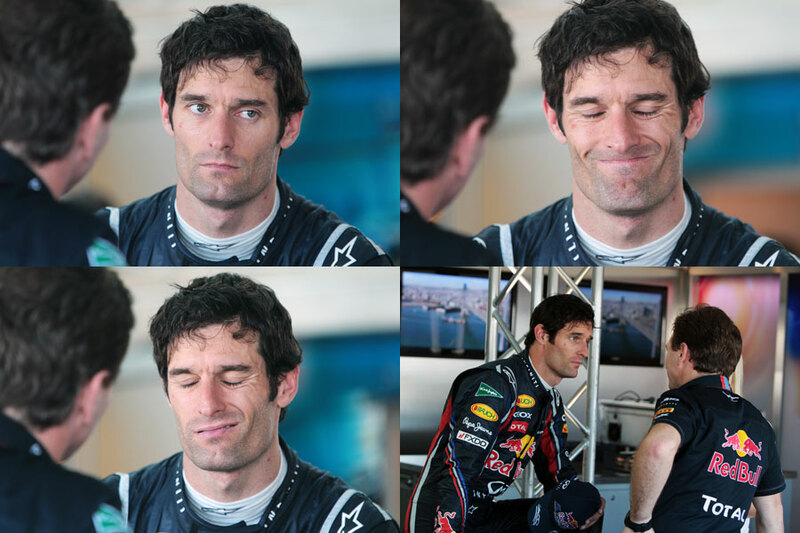 Webber creates some unusual faces at times and he certainly did during this sequence. He probably didn’t see me because it was a bit like a paparazzi shot over this window, but it makes it all the more interesting as you get to see his expressions as he talks with just him and Christian.